For other uses, see Maytag (disambiguation). Admiral, Amana, Jenn-Air, Magic Chef, etc. The Maytag Corporation is an American home and commercial appliance brand owned by Whirlpool Corporation after the April 2006 acquisition of Maytag. The Maytag Washing Machine Company was founded in 1893 by businessman Frederick Maytag. In 1925, the Maytag Washing Machine Company became Maytag, Inc. In the early 1930s, photographer Theodor Horydczak took pictures of the plant and some of its workers. During the Great Depression of the 1930s, the company was one of the few to actually make a profit in successive years. In 1938, Maytag provoked strikes by the company's workers because of a 10% pay cut. The company was able to beat the strike because of the intervention of four military companies, including a machine gun company, of the 113th Cavalry Regiment, Iowa National Guard. At his father's death in 1940, Fred Maytag II, grandson of the founder, took over the presidency. During World War II, the company participated in war production by making special components for military equipment. In 1946, production of washing machines was resumed; in 1949, the first automatic washers were produced in a new, dedicated factory. In 1946, Maytag began marketing a separate line of ranges and refrigerators made by other companies under the Maytag name. During the Korean War, the company again produced parts for military equipment, although washing-machine production continued. During the 1950s, the 'white goods,' or laundry and kitchen appliance industry, grew rapidly. Maytag first entered the commercial laundry field at this time, manufacturing washers and dryers for commercial self-service laundries and commercial operators. In response, other full-line appliance producers began to compete with Maytag in the white-goods consumer market. These included 'full-line' manufacturers such as Whirlpool, General Electric, and Frigidaire, who built not only washing machines and dryers, but also refrigerators, stoves, and other appliances. Since Maytag was much smaller than the full-line producers, the company decided to limit itself to the manufacture of washers and dryers, alongside marketing ovens and refrigerators built by other companies, as a small, premium-brand manufacturer. The company capitalized on its reputation by renaming its corporate address in Newton, Iowa, "One Dependability Square." By 1960, Maytag had ceased marketing ovens and refrigerators, but later began once again to expand into kitchen appliances with its own design of portable kitchen dishwasher and a line of food-waste disposers. Upon the death of Fred Maytag II, the last family member involved in the company's management, E. G. Higdon was named president of the company, with George M. Umbreit becoming chairman and CEO. By the late 1970s, over 70 percent of U.S. households were equipped with washers and dryers, and with approximately 18,000 employees worldwide, the company was established as a dominant manufacturer of large laundry appliances. After the company's acquisition of Magic Chef, Inc., in 1986, a move which nearly doubled its size, the company acquired a new corporate name, Maytag Corporation. In 1989 Maytag acquired Chicago Pacific Corporation. Chicago Pacific Corporation owned Hoover US and Hoover UK as well as Thomasville Brand Furniture. Maytag quickly sold off the Thomasville Furniture brand. Maytag Corporation, led by Chairman Daniel Krumm, next planned to make Maytag a worldwide organization. The UK part of Hoover was to help Maytag expand into Europe. Hoover UK was not doing well financially and offered customers a round-trip ticket anywhere if they purchased a vacuum. This campaign cost the corporation $50 million to settle. Subsequently, Maytag sold off Hoover UK. This was a huge setback for the amount of cash Maytag had in hand and thus started the downward spiral financially. In 1991 Maytag built a new plant in Jackson, Tennessee, for the manufacture of newly designed plastic tub dishwashers. The Plastic tub was developed in Newton, Iowa, but in 1996 Engineering was transferred to Jackson because Mr. Len Hadley, then president of Maytag Corporation, wanted the plant to be self-sufficient. This engineering team engineered a Stainless Steel dishwasher, Tall-Tub Plastic and Tall-Tub Stainless steel product. Engineering crescendoed with a Double Drawer dishwasher which today is manufactured in Findlay Ohio at the Whirlpool Plant, the only Maytag legacy product built in the Whirlpool Appliance line-up. The Jackson plant evolved into a streamlined manufacturing facility that could build thousands of dishwashers daily on multiple lines. This plant was the most efficient plant and was a hallmark for other facilities. Whirlpool closed this plant. In 1997, Maytag Corporation purchased G.S. Blodgett Corporation. Blodgett made ovens for Major Pizza companies at the time of this purchase Maytag was looking at the Turbo Chef line they had been working on up to this point. On January 1, 2009, Maytag (under the ownership of the Whirlpool Corp.) changed the vested lifetime benefits of the Maytag retirees. There is a lawsuit pending in the Southern District Court of Iowa where Whirlpool has asked for permission to change the UAW bargained benefits. The benefits in question were subsequently changed despite any resolution of the lawsuit. 1893 Frederick Louis Maytag, his two brothers-in-law, and George W. Parsons each contributed $600 for a total of $2,400 to start a new farm implement company named Parsons Band-Cutter & Self Feeder Company. They produced threshing machines, band-cutters, and self-feeder attachments invented by Parsons. 1893 Threshing machine-related injuries were all too common, and a strong need for a safer threshing machine was present. The company successfully met this need by developing a threshing machine feeder, a device which fed straw more safely into the threshing cylinder. 1902 The company was the largest feeder manufacturer in the world, and, by 1904, the Ruth was the most popular model. 1905 Maytag introduced the Success Corn Husker and Shredder. 1907 Maytag's first washing machine, the "Pastime", was produced. F.L. Maytag decided to produce these machines during the periods of seasonally related downturns in farm-implement sales. The "Pastime" washers used a wooden tub. A dolly was turned by a hand crank via wooden pegs. This turning action would pull clothes through the water and force the clothes along the corrugated tub sides producing cleaning action. A pulley allowed the machine to be operated from an outside power source such as a tractor or a windmill. 1911 A model of the Pastime with an electric motor was unveiled. 1915 Maytag developed its Multi-Motor gasoline-engine washer. This allowed customers in rural areas without electricity to utilize the automatic washers. 1919 The first aluminum washer tub was produced by Maytag. Prior to this, it had been believed in the industry that aluminum tub washers could not be built. This aluminum tub proved to have numerous advantages over the wooden tub, which had issues with leaking and rotting. 1920 L. B. Maytag, son of the company's founder, began serving as company president. 1922 Howard Snyder invented the vaned agitator. The agitator is placed inside the tub and mounted in the bottom of the tub. The concept was that, instead of washboarding or dragging the clothes, they would be gently agitated. Maytag first introduced this new washer, the 'Gyrafoam', and became exclusively an appliance company. 1924 By 1924, one of every five washing machines were made by Maytag in Newton, IA. 1924 Maytag introduced its first iron. 1925 Maytag was listed on the New York Stock Exchange. 1926 The company was now headed by Elmer Henry Maytag, another son of F.L. Maytag. 1926 On October 12, five trainloads packed full with Maytag Washers were shipped out to the country. At this time, it was the world's largest single shipment of merchandise. Maytag broke its own record in May 1927, and shipped out eight trainloads. 1927 Maytag had produced over a million washers. 1929 Maytag realized earnings of $6,838,883, a pre-war high. Maytag also survived the Great Depression without having a loss for any year. 1934 Maytag begins production of Maytag Toy Racer automobiles on October 11. 1940 E. H. Maytag died and his son, Frederick Louis Maytag II (grandson of F.L. Maytag), became Maytag's head at the age of 29. 1941 Maytag Toy Racer production ends on December 1. During World War II Maytag no longer produced washing machines and instead concentrated on the war effort. From 1941 to 1945, Maytag made design improvements on, and manufactured special components for, military airplanes. These parts were used in sixteen different types of combat aircraft, including the B-29 Super Fortress, the B-17 Flying Fortress, B-26 Marauder, and the P-51 Mustang. 1946 The war ended and washing machine manufacturing was geared back up in Newton, IA. Maytag began selling ranges and refrigerators. 1948 Maytag's second plant was opened in Newton, Iowa. This facility manufactured Maytag's first automatic washers, the "AMP", introduced that year. This was the start of a new age in washing machines for Maytag. 1951 The Korean War was underway, and Maytag built parts for tanks and other military equipment alongside the washing machines. 1953 Maytag introduced its first automatic dryer. 1954 Maytag's first television advertisement was aired. 1958 Maytag introduced the commercial coin-slide washers used in laundromats. 1961 Maytag's corporate headquarters building was dedicated. 1962 Upon the death of F. L. Maytag II, George M. Unibreit became chairman of the board and chief executive officer, and E.G. Higdon was named president. The company would never again be led by a Maytag family member. 1966 Maytag produced its first line of portable dishwashers. Licensed its first Maytag home appliance center. 1967 Character actor Jesse White appears in the first "Maytag Repairman" TV commercial. 1972 Daniel L. Krumm succeeded E.G. Higdon as Maytag president and treasurer, and two years later he was named chief executive officer. 1975 Maytag introduced Maytag-equipped home style laundries. 1981 Maytag acquired Hardwick Stove Company. 1983 Maytag discontinued production of wringer washers, after 76 years. 1985 Maytag introduced the first-ever stacked washer/dryer. 1986 The Maytag Company became the Maytag Corporation. It acquired Magic Chef and the Norge Appliance Company, and started selling a full line of appliances. 1987 Maytag Corporation added a line of front-loading commercial washers. 1989 Maytag acquired the Chicago Pacific Corporation, parent of Hoover. 1989 Gordon Jump of WKRP in Cincinnati fame first appears as The Maytag Repairman. 1991 Maytag contracted with Montgomery Ward & Co, who had previously sold its own brand of appliances which were manufactured by the Norge Appliance Company (Owned by Magic Chef and later acquired along with Magic Chef by Maytag in 1986.) for the exclusive use of the Admiral brand (acquired in the Magic Chef/Norge acquisition) on its consumer electronic goods. (Following Montgomery Ward & Co's bankruptcy and the closure of all its stores in 2002 Admiral would later become exclusive to Home Depot after Whirlpool acquired Maytag). 1992 Maytag began manufacturing dishwashers in Jackson, Tennessee. 1994 Hoover introduced the first SteamVac extractors. 1997 Maytag introduced the first domestically produced high-efficiency washer, the Maytag Neptune. Manufacture of these products were later switched to Samsung Electronics in Korea. 2001 Maytag acquired Amana. Maytag relabels some Amana-built models with the 'Maytag' brand, selling them as Maytag products. 2002 A class-action lawsuit is filed against the company on behalf of Neptune washing machine consumers. 2004 Maytag Corporation announces a loss of $9 million. 2005 Maytag became the subject of a takeover battle between a private investment group in the United States. ( Ripplewood); a three party group composed of Blackstone, Baird and Haier Corporation, a Chinese appliance manufacturer; and the Whirlpool Corporation. On December 22, Maytag stockholders agreed to sell Maytag to Whirlpool, ending Maytag's 112-year history as an independent company. 2006 On March 31, Whirlpool completed its acquisition of Maytag and began integrating the two appliance companies. 2007 Clay Earl Jackson becomes the new Maytag repairman featured in advertising campaigns. During this year, Maytag also celebrates the 100th anniversary of the Pastime washing machine with the introduction of the Centennial washer and dryer lineup. In major appliances, Maytag was among the top three companies in the North American market, offering a full line of washing machines, dryers, dishwashers, cooktops, refrigerators, and ranges under the Maytag, Jenn-Air, Amana, and Magic Chef brands. Maytag also used to manufacture the top load laundry for Crosley until Maytag's merger with Whirlpool. Maytag sold multiple small appliances including a cordless iron under the Maytag brand, a mixer and blender under Jenn-Air, the company also sold the popular Skybox and Rookie home-vending products. In floor care, Maytag owned the Hoover brand, the market leader in North America and the floor-care brand with the highest consumer recognition and buying preference. In commercial products, Maytag owned Dixie-Narco, a leader in refrigerated soft drink and specialty vending machines as well as Jade cooking products and Amana commercial cooking products. Maytag had presence in markets around the world, including sales operations in Mexico, the United Kingdom, Japan, and Australia. The corporation's export sales and marketing, licensing of brands, and international joint ventures was coordinated by Maytag International in Schaumburg, Illinois. In 1988, DOMICOR was established as Maytag Corporation's international division and in 1992 became Maytag International, Inc. which eventually encompassed all of Maytag's worldwide ventures including Maytag Australia, Maytag Japan, Maytag Commercial (Mexico), and Maytag UK. Maytag International, was based in Schaumburg, Illinois, handled the sales, licensing and business ventures of corporate appliances and floorcare brands in overseas markets as well as the administrative support for the international sales organization. This network extended to more than 70 countries worldwide. Maytag International was responsible for export sales and licensing of the corporation's appliances and floor care brands and joint ventures in overseas markets. This network extends to more than 90 countries worldwide. The main office is located in Chicago with major subsidiary offices in Burlington, Ontario (Canada), Monterrey (Mexico), Sydney (Australia), and London (England) and region sales offices in Beirut (Lebanon) and Yokohama (Japan). laundry manufacturing plants in the U.S.: in Newton, Iowa; Herrin, Illinois; and Searcy, Arkansas; and in Mexico: Ciudad Juárez, Chihuahua. Over the following years, Whirlpool closed Maytag plants in Newton, Iowa; Herrin, Illinois; Searcy, Arkansas; and Jackson, Tennessee. The Hoover floor care plant in Canton, Ohio was sold to Techtronic Industries, and its Dixie-Narco vending machine plant in Williston, South Carolina was acquired by Crane Merchandising Systems. (Techtronic and Crane acquired the plants when they acquired the Hoover and Dixie-Narco brands, respectively). Whirlpool has since created a new plant in Cleveland. While holding on to a Maytag legacy workforce, the legacy buildings are no longer in use. In January 2014, Maytag announced a "Generation Five" of the Maytag Repairman, currently played by Colin Ferguson. But instead of commercials showing the repairman waiting around his shop for a Maytag appliance to break, he is playing the part of the actual appliance. ^ "Maytag 1938". .niu.edu. Archived from the original on 2015-09-07. Retrieved 2015-07-15. ^ a b Steven E. Clay, U.S. Army Order of Battle 1919–1941, Fort Leavenworth: Combat Studies Institute Press, p. 635. ^ "Daniel J. Krumm, 67, Chairman of Maytag". NYTimes.com. 24 Nov 1993. Retrieved 3 Jan 2015. ^ "Do your homework before buying - Business - Consumer news - ConsumerMan | NBC News". MSNBC. 2007-04-24. Retrieved 2015-07-15. ^ Peter S. Goodman and Ben White, “Haier Withdraws Maytag Bid,” The Washington Post, July 20, 2005, available at www.washingtonpost.com, accessed August 2011. ^ "Maytag closing means more than loss of jobs". Vindy.com. Retrieved 2015-07-15. ^ "Maytag Corp, Form DEF 14A, Filing Date Apr 1, 2003" (PDF). secdatabase.com. Retrieved May 14, 2018. ^ Justin Bachman, " Maytag Ads Ditch That Old, Bored Repairman for a Younger Model," Bloomberg Businessweek, 9 Jan. 2014. ^ "Ex-Maytag repairman did less work than he claimed". Associated Press. 19 February 2009. Retrieved 20 February 2009. ^ "Paul Berval - Artisans — Emissions.ca". Archives.emissions.ca. Archived from the original on 2010-02-21. Retrieved 2015-07-15. ^ Burghart, Tara (21 February 2007). "Maytag Casting for New 'Ol Lonely". The Washington Post. Retrieved 2010-05-12. ^ "Maytag's Brand Blunder (a focus group of one)". Brand Culture Company. 9 January 2009. Retrieved 2015-07-15. ^ "Rob Frankel - Branding Expert: The Maytag Repairman Gets Even Lonelier". Robfrankel.blogspot.com. 2005-04-28. Retrieved 2015-07-15. ^ Justin Bachman (January 9, 2014). "Maytag Ads Ditch That Old, Bored Repairman for a Younger Model". Business Week. 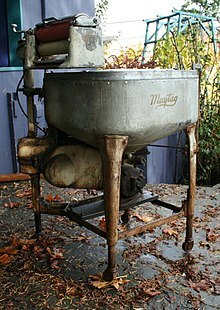 Wikimedia Commons has media related to Maytag. Whirlpool also manufactures appliances under store brands for other companies such as the Kenmore label which is manufactured for Sears Holdings Corporation ( Sears and Kmart), Inglis appliances for Best Buy stores, IKEA brand appliances for IKEA, Crosley and Admiral appliances for Home Depot.